Risk aversion is the main theme in the financial markets today. Worries over US-China trade tension escalation resurfaced after Trump said he will not meeting Chinese President Xi this month. This came despite Trump’s schedule to meet North Korean leader Kim Jong-Un on February 27-28 in Vietnam, just next to China. Re-escalation in trade tension would drag on the already weakened global recovery. US stocks open sharply lower with DOW losing -100 pts, following weakness in Europe. 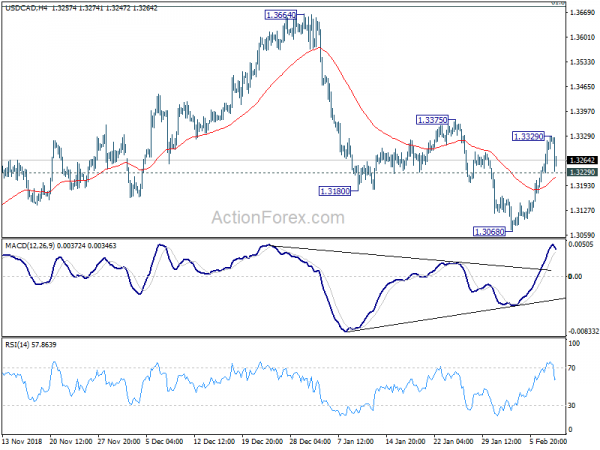 The forex markets are relatively steady though as major pairs and crosses are generally staying in Thursday’s range. While Canadian Dollar surges after strong job data, USD/CAD is, so far, held above 1.3229 minor support. Thus there is no clear confirmation of topping yet. Decline is EUR/USD and EUR/JPY lost momentum ahead of weekly close. In particular, EUR/JPY is holding on to 124.36 minor support despite breaching it briefly. AUD/USD also recovers after earlier selloff and is back above 0.7076 support. Traders mildly want to wait for fresh inspiration next week before committing further. In other markets, DOW is currently down -0.50%. FTSE is down -0.22%, DAX is down -0.78%. CAC is down -0.35%. German 10 year yield is down -0.02 at 0.097, broken 0.1% handle. Earlier in Asia, Nikkei closed down -2.01%. Hong Kong HSI dropped -0.16%. Singapore Strait Times rose 0.04%. Japan 10-year JGB yield dropped -0.0185 to 0.027. Canadian Dollar rebounds strongly in early US session after stellar employment data. The job market grew 67k in January, way above expectation of 6.5k. Employment gains were driven entirely by private sector, which grew 112k. Unemployment rate rose to 5.8%, up from 5.6%, higher than expectation of 5.7%. But that was because “more people looked for work.” Also from Canada, housing starts dropped to 208k annualized rate in January, above expectation of 206k. Released earlier, Germany trade surplus widened to EUR 19.4B in December. Swiss unemployment rate was unchanged at 2.4%. Japan household spending rose 0.1% yoy in December, below expectation of 0.8% yoy. Labor cash earnings rose 1.8% yoy, matched expectations. Current account surplus widened to JPY 1.56T. UK Prime Minister Theresa May will meet Irish Prime Minister Leo Varadkar in a dinner today. May would make use of the opportunity to press for legal binding changes to Irish backstop arrangement in the Brexit withdrawal agreement.